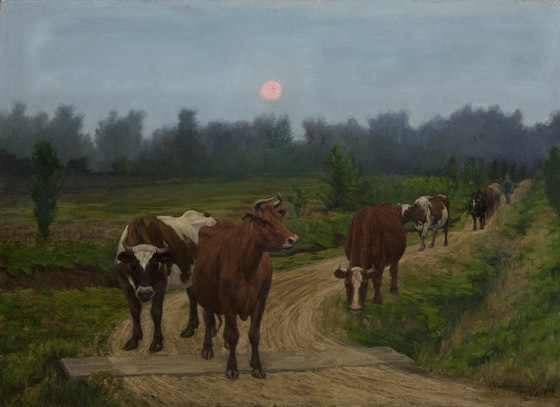 In this bucolic scene, a group of cows comes towards the viewer as the sun sets in the background. The orange sun in a blue sky, both of equal tonality, is reminiscent of the work of Claude Monet. Though Trego’s opinion of them was never very favorable, he was not completely immune to the influence of the French Impressionists. The cows are carefully modeled as are the horses in his many battle scenes. Just as the expressions of the horses were often used to signal the dangers and terrors of battle, here the cows’ subtle expressions of weary contentment are intended to convey the spirit of the scene. The same cows appear in another painting done around the same time, suggesting that Trego’s models lived on one of the nearby farms. Sold in June 2012 at Alderfer's Auction in Hatfield, Pennsylvania, to the current owner. Phil Johnson Ruth, Fair Land,Gwynedd (West Point, Pennsylvania: Merck, Sharp, and Dohme, 1991), p. 93. The painting was cleaned, repaired and restored in 2012 by the Pennsylvania Art Conservatory in Berwyn, Pennsylvania, and is in excellent condition.